My mom hits the big 35 this year-go Mom! :) Woohoo! My mom is seriously one of the cutest sweetest most fun people in the world. I have always felt so lucky to call her my Mama. She has been an amazing mother and a wonderful friend to me my whole life. I can't brag about her enough! I love her so much. I just had to find a few "fun" pictures of her to post this year on her special day. Hope you don't mind Mom! :) Here she is with me up past midnight at The Cheesecake Factory on their dollar slice night. Thats how cool she is. No hour is too late for cheap slices of heaven. 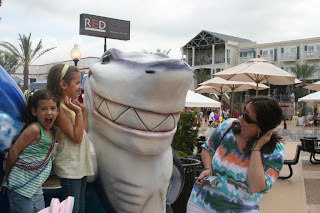 And this is a "fun" picture of my mom doing one of the things she does best, facial expressions:) Here she is with the girls acting very scared of the ginormous shark that is about to devour them. And another prime example of her expressions.....she is even willing to join in on the crazy silliness that we call "family" :) My Mom knows how to roll with the best of em. And then I have to end with a sweet picture. My mom is not only a wonderful and fun mother and friend, but an awesome Grandma. My girls love her dearly. We all do!!! Mom, we all love you so much and hope you have had a wonderful day! We can't wait to see you in a couple of weeks-we are counting down the days! Happy Birthday to my young fun spunky Mama! I know you aren't feelin as young as you used to be, but you still got it goin on! So work it like you own it! Yes, she is sush a wonderful grandma!I love you SO much!Happy Birthday! Aw, Aubrey's comment is so sweet. And yes Mom, you betta work it like you own it, lol. Happy Birthday, Mom!!!!!!!!!!!! Your mom is beautiful! I love all the photos in each of your posts...must be a great combo of your awesome skills and your new camera! Thanks for the birthday post!! We have had a lot of fun over the years haven't we? I appreciate all your kind words- I feel the same way about you. Thanks for making me feel so special on my birthday!! P.S. I love you too Aubrey Ann! Thanks for being such a wonderful granddaughter! See you soon!! 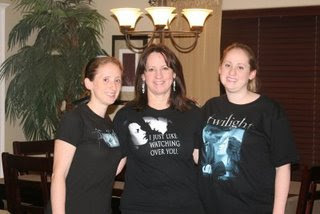 What a wonderful mom you have... and she has wonderful girls. You are all blessed. How nice that she is your best friend. That is the way it should be. Yayy for your mom. Happy Birthday to her!! She's incredibly pretty and looks like she is a lot of fun! I don't know your mama, but because I know you, I know she has to be wonderful. Hope her day was lovely! Oh, and sharks are the coolest. Nothing beats a fun mom! Yours reminds me a lot of mine! Happy birthday mom! 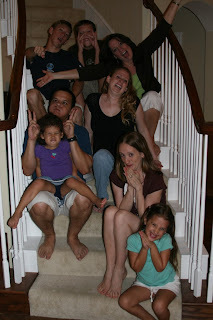 looked at your moms blog and she is my kind of lady! and nothing is better than having your daughter name you as their best friend! haha taylor. i know that is you! Happy Belated Birthday Patti. Hope you had a great day.